Tag line: "They don't negotiate with terrorists... they blow them away!" The very first scene in The Delta Force, an action / drama released by Cannon films in 1986, is a gun battle featuring both Chuck Norris and Lee Marvin as special Ops soldiers, on a secret mission in Iran. Based on this sequence alone, how could you not be excited to see the rest of this movie? Several years after the above gunfight, a pair of terrorists, led by a self-proclaimed revolutionary named Abdul (Robert Forster), hijacks American Travel Ways Flight 282 and orders its pilot (Bo Svenson) to change course and fly the plane to Beirut. In an effort to save the hostages, the U.S. military sends the highly-trained Delta Force to the region. Led by Colonel Nick Alexander (Marvin) and his second-in-command, Major Scott McCoy (Norris), Delta Force puts together a plan they hope will result in very little bloodshed. But it isn't long after the plane lands in Beirut that the situation escalates, leaving Alexander, McCoy and their compatriots with no alternative but to stand and fight. 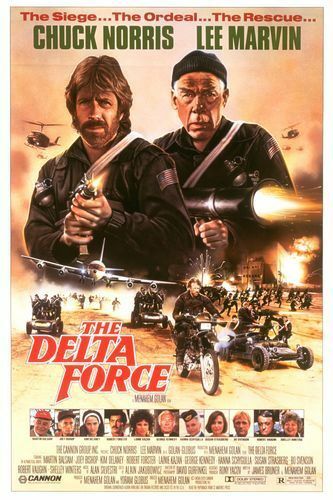 The first thing that impressed me about The Delta Force was its cast, which, like the big-budget disaster flicks of the 1970s, is littered with stars: aside from Norris and Marvin, there’s George Kennedy (as a Catholic Priest), Martin Balsam, Shelley Winters, Joey Bishop and Lainie Kazan (as passengers on their way home from Israel), Robert Vaughn (in a brief role as a military commander), Bo Svenson (as the pilot of the ill-fated aircraft), and, most impressive of all, Robert Forster as Abdul, the leader of the hijackers (his performance is so strong that, at first, I didn’t even realize it was him). With his cast in place, director Menahem Golan constructs what proves to be a multi-faceted action flick, with the first half dedicated to the hijacking and all the drama that surrounds it. Realizing there are Jews on board, Abdul and fellow hijacker Mustafa (David Menahem) have stewardess Ingrid (Hanna Schygulla) collect all the passports, then tell her to go through and pick out those with obvious Jewish names. There are several references to the Holocaust in these scenes, leading to some very intense moments (Balsam’s character has a number tattooed on his arm, signifying he’s a concentration camp survivor, while stewardess Ingrid, a German, at first refuses to help the terrorists, mostly due to the guilt she feels for what happened during the war). Then, at about the movie's halfway point, Delta Force takes over, and we tag along with Norris, Marvin and crew as they try to rescue the remaining hostages (the women and children were released, but the men are being held in a schoolhouse in Beirut, while a handful of Jewish passengers, as well as George Kennedy's priest and two U.S. Navy personnel, are in a separate facility). I liked how Delta Force coordinated their efforts (two teams are sent in, each focusing on a different group of hostages), and, of course, once things get real, Norris and Marvin kick it into high gear. You may roll your eyes a little when the bullets start flying (literally thousands of shots are fired at Norris, many as he’s riding a heavily-armed motorcycle, yet he somehow manages to dodge them). But when all is said and done, The Delta Force is an incredibly entertaining action movie, not to mention one of the best films that Cannon ever produced.